How is Marijuana Abuse Diagnosed? Some users mistakenly believe that marijuana's legal status and medical benefits mean that it is safe. Any drug, though, is subject to compulsive use and can become addictive--marijuana is no exception. Current research suggests that between 5% and 10% of marijuana users will eventually become addicts--a figure that is similar to the alcohol addiction rate. Marijuana is one of the world's oldest known drugs, with evidence of its use dating back to ancient cultures in China and Egypt. Today, marijuana is the subject of ongoing political controversy. It's legal for medical use in at least 23 states, and a handful of states--including Oregon, Washington and Colorado--have legalized it for recreational use. Marijuana doesn't fit neatly into any drug category, and its effects vary depending on the user and the strain of marijuana he or she takes. There are more than a dozen cannabinoids in marijuana. These chemicals bind to cannabinoid receptors in the brain, resulting in a quick high. The addictive component of marijuana is tetrahydrocannabinol (THC). THC accounts for the foggy thinking and euphoria, but other chemicals can produce a wide range of other effects--such as the reduction in nausea so many cancer patients report with this drug. Increased giddiness and frequent laughing. Difficulty concentrating; people under the influence of marijuana often jump rapidly from topic to topic. Smelling like smoke or marijuana. Presence of marijuana paraphernalia, such as rolling papers or a water pipe in the house. It's not possible to overdose on marijuana. Animal tests have revealed that one has to consume an extremely high amount of cannabinoids to achieve the morbid consequences common to other types of drug overdose. While this makes the drug slightly safer than some others, it also encourages users to take high doses. The specific effects of marijuana use are dependent on the length of use, the mechanism of delivery and individual health factors. For example, someone who smokes marijuana is more vulnerable to lung problems while someone who has a history of binge eating may binge even more while under marijuana's influence. Cardiovascular problems, especially if you smoke the drug. Difficulty feeling "normal" without marijuana. Career, medical, and relationship difficulties. Changes in libido or fertility. Stunted brain development among teen users. Weight gain due to marijuana-related appetite increases. Marijuana is particularly difficult to give up because people are reluctant to let it go. Don't miss this opportunity to seek help. Call our treatment support specialists at 1-888-993-3112Who Answers? 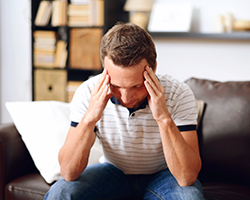 to talk about treatment resources you can avail to overcome marijuana addiction. marijuana, you might try drugs you otherwise wouldn't, or opt for higher doses. You may also struggle to recognize when you're high or have used too much, so marijuana indirectly increases your risk not only of a drug overdose (due to mixing), but of drug-related dangerous behavior. If you go through withdrawal in between doses or experience intense psychological pain when you attempt to quit using, you may be addicted.Marijuana abuse tends to set in over time, so it can be tough to discern whether you're a recreational user, an addict or a person getting a legitimate medical benefit from the drug. In general, if you go through withdrawal in between doses or experience intense psychological pain when you attempt to quit using, you may be addicted. Similarly, many addicts continue using even when the drug no longer gets them high or persist in abusing marijuana even when it yields unpleasant life consequences. Research suggests that people with a history of mental illness are especially vulnerable to marijuana addiction. Marijuana helps ease feelings of depression and anxiety on a short-term basis, and this relief can be a tempting option for someone who does not want to try prescription drugs or for whom therapy has been unhelpful. Some studies indicate that ADHD significantly increases your risk for marijuana addiction. Genetic legacy of marijuana addiction. Marijuana's use as a medical treatment is still relatively new, so it's not yet clear whether medical use of the drug increases the likelihood of addiction. What is clear is that no one becomes a marijuana addict without trying the drug. Thus, the most significant risk factor for marijuana addiction is prolonged use at high doses. People with low body mass indexes and teens are especially vulnerable to addiction. Admitting that you have a marijuana addiction can be embarrassing, especially in a culture that insists that marijuana is not addictive or dangerous. If marijuana use is interfering with your normal daily functioning, that alone could be reason enough to seek treatment. Any drug that changes the way you think can turn addictive, though, and the longer you allow your addiction to progress, the more power it will have to control you and your life. Addiction is a disease, not something you chose, and like other diseases, it will only get better with the right treatment. Experiencing legal, financial, medical, or relationship problems due to your reliance on marijuana. Using marijuana to cope with a health problem. Relying on marijuana to improve your performance. Depression, anxiety, or loss of motivation. Feeling like you can't be normal or yourself without marijuana. Loved ones requesting that you seek help or stop using. Organizing your day or life according to when you'll next be able to use marijuana. Get Support Narcotics Anonymous is a 12-step recovery program that helps those with addictions to marijuana and other drugs. Find a local NA meeting for you or your loved one. 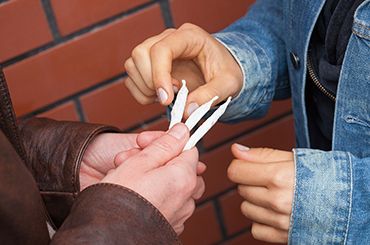 It's easy to dismiss marijuana addiction as somehow less severe than other drug addictions. After all, no one ever overdosed on marijuana, and plenty of people use the drug without a problem. If someone you love struggles with a marijuana addiction, their struggles are just as real as that of any other addict. Addiction is not a choice, and derision will only alienate your loved one. If you want to help him or her get clean, the key is to offer support without enabling the addiction. Help your loved one explore his or her treatment options, and highlight the ways in which marijuana has negatively impacted his or her life. If your loved one refuses to seek treatment, be prepared to set clear boundaries. For many family members, an intervention affords the chance to encourage treatment while also setting limits. Whatever your boundaries are, you need to stick to them. It might be hard not to help an addict you love, but giving money to an addict or offering them a place to stay when they refuse treatment only gives them an incentive to keep using. Some addicts have to hit rock bottom before they're willing to accept the treatment they need. Marijuana addiction can leave you feeling despondent and worthless, but that's the addiction talking, not a reflection of the reality of your life. Addicts have a number of treatment options at their disposal, the most intensive of which is inpatient rehab. 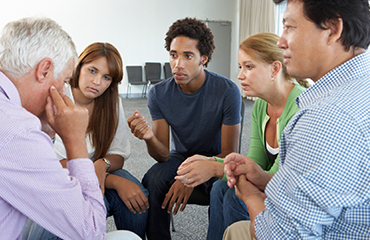 Inpatient rehab blends therapy, medical care, group support, lifestyle changes, and education about addiction with a safe and drug-free environment. Rehab can be the best route to sobriety, particularly for addicts who experience intense withdrawal and for those who face family or work stress that can hamper their treatment. A generation ago, rehab facilities were rather plain, and residents often shared a room. Today, more and more facilities offer luxury treatment programs. These programs afford you access to excellent food, plenty of enrichment activities, and gorgeous scenery. You may also have a private room, and much more freedom regarding how you spend your time. If a luxury facility sounds great, but career concerns leave you hesitant to try rehab, consider an executive program. These programs, which cater to busy professionals and high-profile figures, offer plenty of privacy and a chance to continue your work. Most have business centers, and many allow you to meet clients at the facility. Depending on where you are in your recovery, you may even leave for brief periods of time to fulfill your job duties. Short-term detoxification programs that last a few days. These programs help get you clean without requiring a long-term time commitment. Most marijuana addicts do not need detox programs, but if you have another co-occurring addiction, detox can help you get sober. Medical assistance: Can help with controlling the symptoms of withdrawal, and treat any underlying medical conditions that contribute to your addiction, while reducing drug cravings. Therapy to help you understand why you became an addict and what you can do to kick the habit. You can identify coping strategies and relapse prevention techniques. 12-step programs such as Marijuana Anonymous: You'll find a sympathetic group of recovering addicts at such a program, and can even pick a sponsor--an addict farther along in his or her recovery journey, whom you can depend on when you need extra support. Partial hospitalization programs: Sometimes referred to as intensive outpatient, this approach to recovery is a kind of daytime rehab. You attend sessions during the day, receiving therapy, medical care, and access to 12-step programs, then return home in the evenings. Marijuana is second only to alcohol as the most popular drug among teens. 44% of 12th graders have used the drug at least once, with 6% using it during the last month. Parents who catch their teens abusing marijuana may be tempted to ban the drug and punish their teen. But if your teen is an addict, punishment won't work. Indeed, the stress associated with an angry parent might even encourage her to continue using. 44% of 12th graders have used the drug at least once, with 6% using it in the last month. authority as a parent to compel her to get the help she needs. Marijuana addiction is not directly fatal, but it has the power to sideline careers and relationships while destroying an addict's quality of life. Treatment works, and no addict deserves to suffer alone. By seeking treatment now, you take a powerful first step toward a better life for yourself or the addict you love. Dealing with the addiction of a child is almost unbearable, and this is exacerbated in the case of marijuana because of conflicting views about how addictive it is. To find out more about marijuana addiction treatment and how to help a marijuana addict, please call our confidential hotline at 1-888-993-3112Who Answers?.